Whether your group is coming in town to take part in a tournament or hosting a training camp, you can walk away knowing that you won’t have to worry about where to stay while you are here. Our Group Sales Department is here to take all the stress off when you and your team are on and off the field. We can offer you an array of room types to choose from and guarantee them with exclusives room blocks, as well as allow you to add extra rooms for the family and fans coming with you watch the big event. We’d like you to think of us as just another part of the team that is working hard for you, so you can play hard during the game. Whatever the need, we have a vast array of venues. From small intimate rooms to vast ballroom spaces we can accommodation 10-300 people. A number of our resorts are equipped to allow complimentary bus parking for all groups types staying at our hotels. Our resorts all within close proximity to local sports venues and the new Myrtle Beach Sports Complex. Rest easy for that big game or tournament this year and know that everything you need on your stay is right at your fingertips. Teams find comfort and convenience due to our location being only minutes from many local sports facilities. Nested directly in front of the 1.2 mile oceanfront boardwalk, young athletes will stay entertained while coaches and parents kick back and relax! Our inviting beds and mesmerizing ocean views are what will naturally benefit your performance in the field or on the court! The kids say it’s their favorite place! An abundance of amenities and services await parents, coaches and athletes ready to show you how we can turn this trip into a winning mini vacation. Your team will experience a nutritious breakfast buffet designed for your team of champions at the newly renovated Papa’s Restaurant. Reward your athletes with unlimited DVD rentals or a visit to The Mist Spa located on one of our sister properties for discounted pre or post tournament sports massage. Welcome all Sports teams! Centrally located in Myrtle Beach, The Caribbean Resort has been on the radar for traveling sports team for many years! With our very own water slide, the kids say there’s no other place they would rather stay! A breakfast buffet ready to serve your team of champions at The Sea Captain’s House awaits your morning pep talk right next door while our NEW spa located on-site offers pre or post tournament sports massage services for athletes, coaches and parents! The Compass Cove Resort has been quite the popular place for traveling sports teams coming to the Myrtle Beach area for many years. With our very own water park and indoor game room, there is no wonder it’s a kids choice and a parents dream! With the abundance of on-site amenities and services, post tournament fun will have the team rejuvenated and confident for the big game day! Enjoy a breakfast buffet designed for your team of champions right on-site at the newly renovated Compass Rose Restaurant. Have your team join our team for an unbeatable experience! Dayton House is a family friendly resort that offers one of the largest oceanfront lawns the beach has to offer, hosting fun,exciting games young athletes are sure to enjoy in their down time. Breakfast at John’s Restaurant is will provided all of the energy you need to bring in the win, while our relaxing ocean back drop will be what naturally benefits you in the field or on the court! Located on the stellar northern end of Myrtle Beach, and only a short distance from local sports facilities, The Long Bay Resort has been a go-to property for traveling sports teams for many years. We know your schedule is important when traveling for a tournament so we ensure post tournament fun is never an issue and a good meal is never but a few steps away. A good place to start is Martins Restaurant right on-site where you can fuel up with a bountiful breakfast buffet or a delicious dinner. Utilizing these conveniences will ensure your athlete gets a good nights rest without missing out on the fun of travel! Where luxury meet relaxation, North Beach Plantation is the Grands Strands answer for paradise. Your athletes will unwind in style while our 5 star amenities serve their needs for rejuvenation and focus. Tucked away in a private corner of North Myrtle Beach our plantation provides all your traveling team desires from onsite award winning restaurants to onsite spa services and so much more! Come encounter the spectacular northern stretch of Myrtle Beach, SC, only a short distance from all major sports facilities. Enjoy a full hot and cold breakfast buffet designed to fuel your team of champions right on-site at the Café’ Du Port Restaurant. Take advantage of the convenient varieties within a short stroll like River City Cafe or Starbucks! After a full day of winning Ocean Reef happily provides many complimentary activities for you and your all-stars right here on property! Indoor and outdoor pools, a lazy river, unlimited DVD rentals, daily attraction tickets for Free, our very own water slide, plus so much more! We have plenty of choices to keep everyone busy in their down time. The Paradise Resort is the perfect location for exploring! 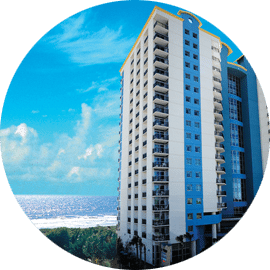 Built on the southern end of Myrtle Beach, The Paradise Resort allows you convenient access to to many wonderful restaurants and attractions with-in a short distance. Reward your athletes with an oceanfront pizza party in our picnic areas or enjoy our Sandals restaurant right on-site. For off-site fun explore the up-town experience of the Market Commons only 2.5 miles away, offering dining, shopping and the best movie theater in town! Your team will love The Strand and all of its advantages! Centrally located, you will have more time to spend exploring with convenient access to many wonderful restaurants and attractions within walking distance! Spend as much time as you would like taking a stroll down the boardwalk, shopping and dining at the best the beach has to offer!